Of this plant, the leaves are most common as a spice. However, root and fruits have the same taste and may be used if a stronger lovage taste is desired; the root is used as a diuretic drug and may be available in a pharmacy, but the fruits are not traded. Strongly aromatic, remotely similar to celery. There is also a faint reminiscence to the flavour of blue fenugreek leaves. Fresh leaves contain max. 0.5% essential oil; most important aroma components are phthalides (ligustilide, butylphthalide and a partially hydrogenated derivative thereof called sedanolide). Terpenoids (terpineol, carvacrol) and eugenol are less important. 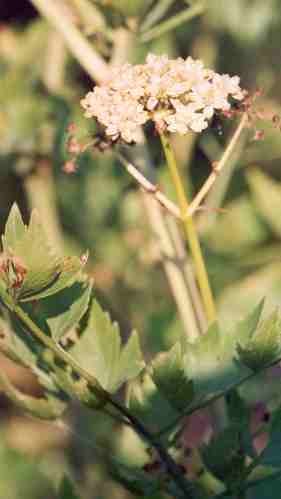 Phthalides also ap­pear in some other plants from the carrot family, in particular the related celery. 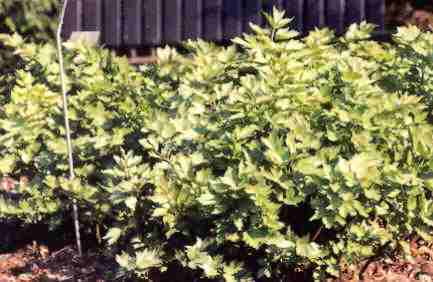 Apart from this, these com­pounds are rare in the plant king­dom. The hetero­cyclic aroma compound sotolone, which has been found both in fenugreek and in Maggi sauce, can be seen as a phthalide-related, simpler structure where the condensed benzene ring is missing. This chemical similarity might account for the similar flavour of lovage and fenugreek leaves, and also that of Maggi sauce, although I find the latter similarity less striking. Both English lovage and German Liebstöckel seem to contain an element meaning love , but this is just a product of folk etymology. 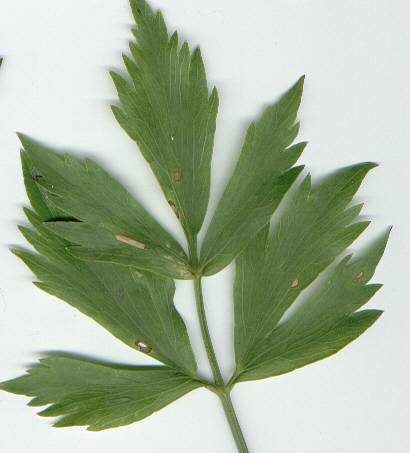 Instead, the two words are related to almost all names of lovage in current European languages, e. g., French livéche, Norwegian løpstikke, Finnish lipstikka, Estonian leeskputk, Latvian lupstājs, Czech libeček, Romanian leuștean (leuştean);, Hungarian lestyán, Greek levistico [λεβιστικο] and Ukrainian lyubystok [любисток]. 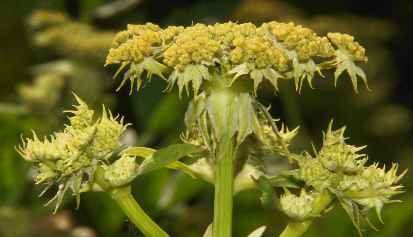 These names go back to Latin ligusticum, shortened from ligusticum apium Ligurian celery , because lovage was and is particularly plentiful in the Western Italian region called Liguria. For the derivation of apium, see celery. 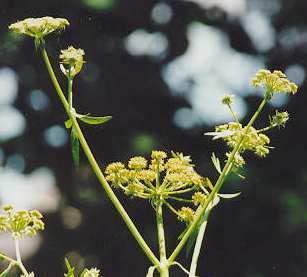 English lovage directly originates from Middle English loveache, which in turn was borrowed from Old French luvesche. The German name Maggi­kraut Maggi herb goes back to Maggi sauce, a condiment very popular in the 60s and 70s. It is a con­centrated, salted solution of browned and partially hydro­lyzed proteins in water with addi­tional flavour­ing; I cannot agree on its similarity to lovage aroma. There a few more analogous names in tongues of Central and Eastern Europe, e. g., Croatian Magi-začin Maggi condiment and Slovak Korenie Maggi maggi spice . Lovage is a traditional spice in Southern Europe whose usage dates back to antiquity; indeed, lovage was one of the most prominent flavours in Roman cookery, and people interested in recreating the foods of Old Rome are well advised to find a continuous supply of that herb, or grow it them­selves, instead of substituting it by something else (e. g., celery), as some books suggest. See also silphion for a fuller account of the flavours in ancient Rome. Today, lovage is still common in Southern and Central Europe, but it has not found many friends outside this region. Its characteristic flavour fits well to sour pickles and aromatic vinegars (see dill); furthermore, beef stock is commonly flavoured with lovage leaves (see parsley on German versions of bouquet garni). In Germany, lovage is a popular flavouring for potato dishes. 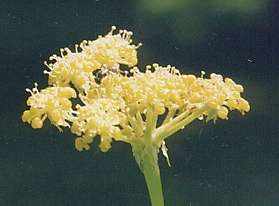 In Italy, lovage usage culminates in Liguria, where of old the spice is cultivated (see above). 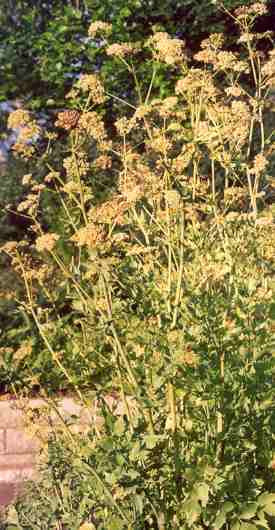 Lovage is chiefly needed for tomato sauces, often in combination with oregano; it may be efficiently combined with rue. The contemporary distribution of lovage, encompassing the Alps and Southern Germany, can be traced back to the early Middle Ages: At the begin of the 9.th century, Charlemagne wrote an edict called Capitulare de villis vel curtis imperii Caroli Magni in which he defined a large number of administrative, legal and particularly agricultural rules for the Frankish empire. At the end of the document, we find a large list of culinary and medical herbs that should be grown in every Imperial garden. All the capitularia were written in a sort of Medieval Latin, which was the only language spoken and understood all over the empire. Move the mouse over the Latin text to see the translation of the plant names (HTML 4.0, CSS level 1). De arboribus volumus quod habeant pomarios, diversi generis, prunarios, diversi generis, sorbarios, mespilarios, castanearios, persicarios, diversi generis, cotoniarios, avellanarios, amandalarios, morarios, lauros, pinos, ficus, nucarios, ceresarios diversi generis. The paragraph closes with some more lines concerning different breeds of apple trees. Some plants from the above list cannot be unambiguously identified botanically; see also pomegranate about the difficulties in identifying plants mentioned in the bible. Due to its enumerative nature, it is difficult to render the text in an easy-to-read way, especially if alternative plant identifications shall also be indicated. The following is a compromise aimed for improving readability; move the mouse over the text to see modern botanical names (HTML 4.0, CSS level 1). We want that they should have all herbs in the garden, this is flag (? ), dog rose, fenugreek, costmary, sage, rue, southern­wood, cucumbers, musk melons, bottle gourds, cowpea (? ), cumin, rosemary, caraway, chickpea, squill, gladiolus, snakeweed (?, ? ), anise, cococynth (? ), heliotrope (? ), baldmoney (?) sermountain, lettuce (? ), nigella, rocket, watercress, burdock, pennyroyal, angelica (? ), parsley, celery, lovage, savine, dill, fennel, chicory, burningbush, mustard, savory, water mint, spearmint, horse mint, tansy, catmint, centaury (? ), poppy, Swiss chard, hazelwort, all mallows, that is marsh mallow and common mallow, carrots, parsnips, orache, amaranth, turnip, cabbage, onions (? ), chives, leeks, radish, shallots, onions, garlic, madder, fuller's teasel (? ), broad bean, peas, coriander, chervil, caper spurge, clary sage. And each gardener shall have roof houseleek (Jupiter's beard) growing on the top of his house. Of the trees, we wish that they should have apples (?) of various kinds, plums of various kinds, sorbs, medlars, chestnuts, peaches of various kinds, quinces, hazelnuts, almonds, mulberries, bay laurel, stone pines, fig, walnuts, sweet cherries (?) of various kinds. The Capitulare de villis helped greatly in the unification of agricultural techno­logies, and it provided for a super­regional distribution of cultigens and the know-how associated with them. The plant list of Charlemagne kept its canonical character during the whole Middle Ages, up to the 18.th century: The plants of Charlemagne were grown in monasteries of suitable climate. Many culinary herbs of Mediterranean origin became known, by means of the Capitulare, in the more Northern parts of Central and West Europe; some of them could establish themselves permanently in those cooler regions, where their growing may need more care, or more breeding effort. 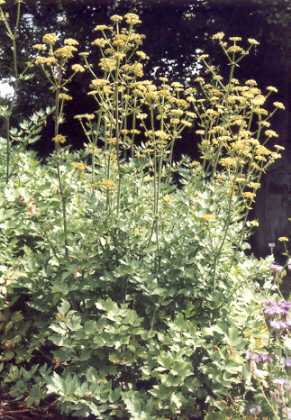 Examples include lovage, parsley and celery; also southernwood could be named, as it has survived in German or British peasants’ gardens to this day. Other Carolingian cultigens, however, were abandoned for climatic reasons (e. g., almond) or got suppressed by others (e. g., cumin). Although the fruits of lovage can be used as a spice, they are (to my knowledge) not traded. Sometimes, however, ajwain fruits are mislabeled as lovage seed . 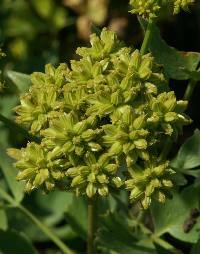 True lovage seeds are required in some of the ancient Roman Apicius recipes (see silphion).